Your chances of Canadian Immigration doubled! Newfoundland and Labrador wants to increase its annual immigration with 50%. Currently, there are plenty of ways for you to settle in Newfoundland and Labrador as a permanent resident. The government of Newfoundland and Labrador wants its annual immigration numbers to increase to 1,700 new permanent residents per year, an increase of around 50 percent on current intake numbers. The 26-page document also includes plans on ways to improve immigrant retention rates, as well as strategies to entice Newfoundlanders to return to their province. The plan is divided into two broad phases, with the first phase being covering the year 2017, and the subsequent phase covering 2018 to 2020. Of the 39 initiatives planned, 24 are scheduled to be rolled out in phase one. Initiatives for 2017 include improved processing procedures, working with third parties on settlement services, expanding and improving the provincial government’s immigration websites, and the possibility of new categories within the Newfoundland and Labrador Provincial Nominee Program (NLPN), one of Canada’s Provincial Nominee Programs (PNPs). By 2020, the province aims to have built on these initial efforts with further initiatives, including a new portal that would allow applicants and employers to track their progress in relation to the NLPNP. The NLPNP – This program has streams for skilled workers 9including skilled workers in the federal Express Entry Pool) and international graduates. The NLPNP is currently responsible for almost 50 percent of all immigration to the province. The Canadian government, through the department of immigration, Refugees and Citizenship Canada (IRCC), operates a number of federal economic immigration programs, namely the Federal Skilled Worker Class (FSWC), the Federal Skilled Trades Class (FSTC), and the Canadian Experience Class (CEC). These programs are managed through the Express Entry immigration selection system. Newfoundland is the easternmost province in Canada and is one of the four Atlantic Provinces. The province is comprised of the island of Newfoundland, as well as Labrador, which is situated on the mainland, bordering Quebec. 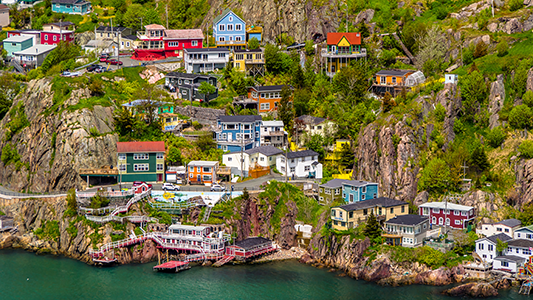 Newfoundland is home to a population of about 525,000 people, the majority of which live in coastal fishing villages. 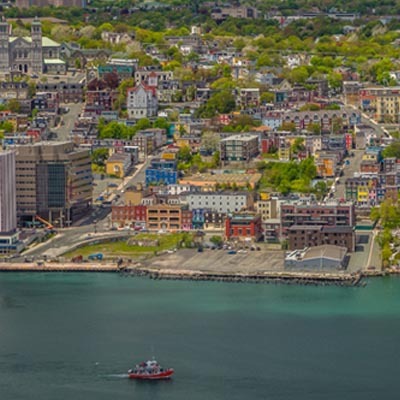 St. John’s, the capital city and the historic commercial center of the island, is by far the province’s largest city, with a population of approximately 177,000. Other major centers of population are Grand Falls, Windsor, and Corner Brook. Smaller communities often referred to as “outports” are more traditional villages that remain an important element in Newfoundland society. Newfoundland’s economy is highly dependent on natural resources. The largest industry, fishing, has been adjusting to the depletion of fish populations, and the reduction of fishing quotas, since 1989 by developing new techniques and strategies, though the industry continues to face challenges. The second most prominent industry in the provincial economy is the mining industry, exporting roughly $700 million worth a year, mostly in the form of iron ore from Labrador. The third largest industry consists primarily of three pulp and paper mills. The energy sector is also an important part of the Newfoundland economy. The largest hydroelectric facility is located in Churchill Falls, Labrador with a total installed capacity of 5403 megawatts. Newfoundland also has significant offshore oil reserves estimated at 615 million barrels which are now being developed and extracted at an increased pace. The province of Newfoundland faces challenges to overcome the decline of its fishing industry, which has traditionally been the center of the province’s economy. With many residents having worked their whole careers in the industry, Newfoundland faces Canada’s highest unemployment rate at15.2%. The province is investing heavily in re-training programs and new growth industries and is experiencing some success at moving its economy away from dependence on natural resources. In Canada, all citizens and permanent residents under the age of 20 are entitled to free education through the end of high school through the public school system. Newfoundland and Labrador offers an excellent public education system for grades Kindergarten through 12. In addition, this system is augmented with government-funded early childhood education as well as adult education programs and apprenticeship programs. The province’s public post-secondary institutions consist of the Memorial University of Newfoundland and the College of the North Atlantic. Average tuition fees rank second lowest in the country at $2,600/yr. There are also a number of privately operated, government-regulated Career Colleges throughout the province. In addition, there are 27 privately operated Career Colleges in Newfoundland and Labrador providing quality career-oriented education and training. Under Canadian Law, all provinces and territories must provide universal, publicly funded health care to all citizens and legal residents of Canada. In other words, most basic health services in Canada are offered at no direct cost to the patient. Certain procedures that are not deemed necessary (such as elective cosmetic surgery and a number of dental care procedures, for example) are generally not covered, but the list of services paid for publicly varies from province to province. Newfoundland, like the rest of Canada, has universal, publicly funded health care. The Newfoundland Health Plan covers all essential medical services.